Home | Makers | Tiffany & Co.
It’s one of the most memorable scenes in cinema: Audrey Hepburn as Holly Golightly gets out of a taxi in front of Tiffany & Co. on Fifth Avenue, sips her coffee from a paper cup, and gazes dreamily into the window. When Breakfast at Tiffany’s debuted in 1961, Tiffany was already 124 years old, and its little blue box was a renowned symbol of romance and style. It all started in 1837, when Charles Lewis Tiffany used a small loan from his father to open a fancy goods store in New York City with his school friend, John B. Young. The revenue for their first day in business was $4.38. But business grew quickly, and by the early 1850s, Mr. Tiffany had sole control of the firm and a new store in Paris. 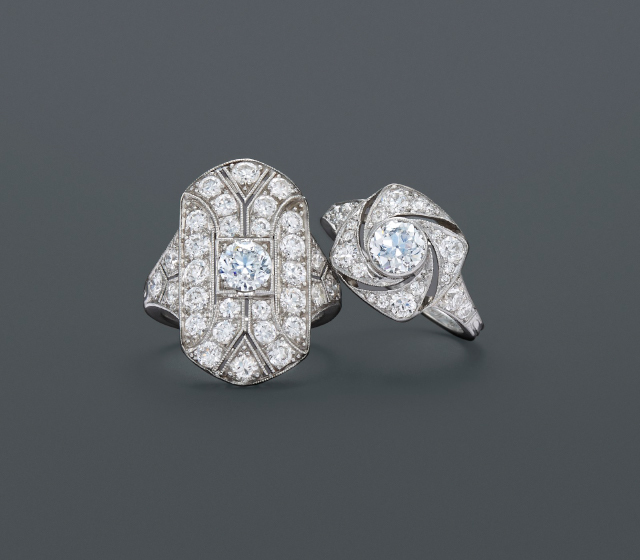 Mr. Tiffany’s obsession with extraordinary diamonds brought the company international acclaim. In 1877, he purchased a 287-carat fancy yellow rough diamond and had it cut to reveal the 128.54-carat Tiffany Diamond, one of the world’s most famous gemstones. In 1886, he introduced the Tiffany Setting, the six-prong diamond ring that has become known as the quintessential expression of love. In 1887, he acquired pieces from the French Crown Jewels, reinforcing his position as a diamond authority. Tiffany championed the beauty of lesser-known gemstones, too. Beginning in the 1890s, Tiffany’s chief gemologist, Georg Kunz, traveled far and wide in search of extraordinary specimens. In 1902, he discovered a distinct variety of lavender spodumene in California, which was named kunzite in honor of him. He also debuted a pink beryl discovered in Madagascar in 1910, which he named morganite after Tiffany client J. Pierpont Morgan. In later years, Tiffany garnered more publicity for gemstone discoveries—tanzanite in 1969 and tsavorite in 1972. Captivating gemstones require exceptional design. In fact, Mr. Tiffany’s motto was “Beautiful design makes a beautiful life.” As the company won prize after prize for design and craftsmanship at the world’s fairs and expositions, Tiffany gained a reputation on par with the European jewelry houses. In 1902, Louis Comfort Tiffany, Charles’s son, became the company’s first design director. A leader of the Art Nouveau movement, he created naturalistic jewels with blackberries, dandelions and grapes, but he is probably best known for his stained glass lamps that reside in private collections and museums. Tiffany would shine during the Jazz Age with long ropes of pearls and must-have diamond bracelets, and forge through the 1940s with Retro jewels. The house’s next laudable design moment arrived with Jean Schlumberger in 1956 and his imaginative, nature-inspired creations.